This picture brings me such joy. Like crazy stupid blubbery joy. 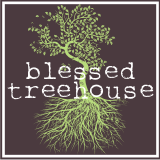 Have I ever told you how excited I get when "Blessed Treehouse" is bolded in my Google Reader? Have I ever told you that I love your husband? Meaning that I think he is friendly and nice and a wonderful fit for you and so good with his kiddos and I love to watch you all as a family serving God together. Look how big she's getting... ALREADY!! I love blubbery joy!! And I love you too! !